RBTH presents a selection of views from leading Russian media on international events, featuring analysis of Russian-Cuban relations ahead of U.S. President Barack Obama’s meeting with Cuban leader Raul Castro in Panama, as well as U.S. Secretary of State John Kerry’s warning to Iran not to participate in the Yemeni conflict, and a report on the intensification of military cooperation between the Nordic countries to counter the "Russian threat." 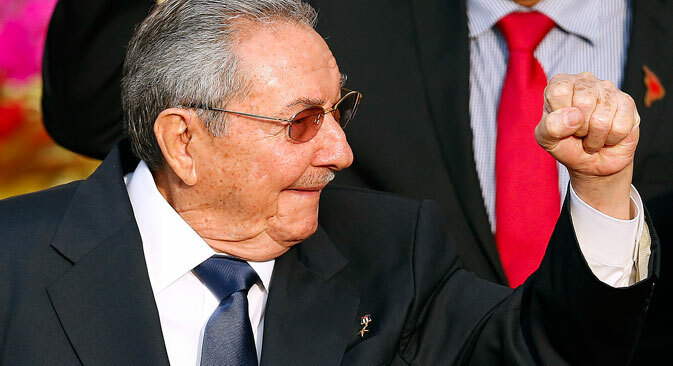 The Gazeta.ru online newspaper writes that the main event of the Summit of the Americas in Panama will be the meeting between U.S. President Barack Obama and Cuban leader Raul Castro. Although official talks between the leaders at the meeting of Latin American nations have not been planned, Obama and Castro will hold an informal dialogue on the sidelines of the summit, which will be the first full-fledged meeting between the two heads of state. According to Deputy Director of the Latin American Institute Vladimir Sudarev, Obama's steps towards Cuba still do not have support from Congress, which is dominated by the Republicans. "After Obama's departure any scenario is possible," says Sudarev. In the event of a full cancelation of the trade embargo and the arrival of American companies in Cuba, Russia will be left in a harsh competitive climate with a risk of losing established connections. "Cuba was always a special foothold for Russia in Latin America," explained Boris Shmelev, director of the Center of Political Studies at the Russian Academy of Sciences’ Economics Institute. "Havana will start maneuvering, trying to get the most out of its relations with Moscow while developing cooperation with the U.S., because this of course is advantageous for Cuba. However, with the current political team in Havana there will not be any unexpected turns in Russian-Cuban relations." The centrist newspaper Nezavisimaya Gazeta reports that U.S. Secretary of State John Kerry has warned Iran not to engage in support for the Houthi uprising in Yemen. "Iran needs to recognise that the U.S. is not going to stand by while the region is destabilised or while people engage in overt warfare across lines, international boundaries and other countries," Kerry said on April 8. For three weeks straight the Houthi rebels, Shiites from the Ansar Allah Organization, have been trying to take the city of Aden on Yemen’s southern coast by storm. Aden is the last stronghold of exiled president Abd Rabbuh Mansur Hadi. Nezavisimaya Gazeta says experts are warning that, having signed the international deal on its nuclear program, Iran will not weaken its support for Shiite forces in the region. Moreover, the gradual removal of the U.S. and EU sanctions will fill Iran's coffers, which will further contribute to empowering radical circles in the country's leadership. Iran's attempts to strengthen its influence in the Arabian Peninsula are clear, as is the desire of the United States to counteract it. However, according to Nina Mamedova, director of the Iran Department at the Russian Academy of Sciences’ Center of Middle East Studies, if the U.S. exerts too much pressure on Iran it could be dangerous. "For the U.S. and for Russia it is useful to maintain a balance of power in the Middle East," explains Mamedova. "If there is significant pressure now, there is a great risk that the preliminary agreements on Iran's nuclear program will fail." The Kommersant business daily writes that the Nordic countries – Sweden, Norway, Finland, Denmark and Iceland – have decided to strengthen their military cooperation in order to counter "threats from Russia." In a public statement, the countries' defense ministers have agreed to intensify their collaboration in the military industry, as well as in reconnaissance and high-tech developments. Moreover, they intend to conduct more joint military drills. For example, Sweden and Norway will host air force drills for the Northern European countries in May. American pilots are expected to participate in the exercises, says Kommersant. The statement from the five ministers points to "Russia's growing military and reconnaissance activity in the Baltics and in our northern regions." The Nordic countries also decided to strengthen their military cooperation with the Baltic states – Latvia, Lithuania and Estonia. Kommersant underlines that the ministers' statement was issued after Russian President Vladimir Putin had announced that Russia was going to conduct large-scale drills that would "encompass all military regions and types of forces." Iranian oil sanctions: What will Tehran’s return to market mean for Russia?